The social network is celebrating its tenth birthday, but the next couple of years could be its toughest yet. 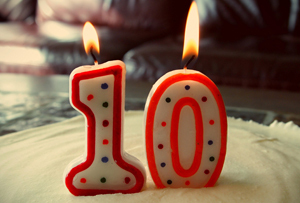 Twitter might not be in the mood to celebrate at the moment, considering the constant barrage of doomsday predictions it's had in recent months, but the tech giant has just reached its tenth birthday. Back in 2006 of course it was in totally different shape – it didn’t even have vowels in the name Twttr and founders Jack Dorsey, Evan Williams, Biz Stone and Noah Glass initially launched it as a kind of SMS service for users to communicate with a small group. It now plays host to everything from celebrity spats to breaking stories. And of course, a hunting ground for journalists when it's a particularly slow news day. How many times have you seen a ‘Twitter reacts to...’ or ‘So and so gets a backlash on Twitter’? As a platform, it has changed how we follow the news and how we tell it. There have been numerous articles already, running down some of the biggest moments in Twitter's ten-year history. Many have been significant news stories – The Arab Spring, London riots, the Black Lives Matter movement – all were chronicled on the platform to great effect. Twitter has also been a notable development for brands, as they compete to hone real-time marketing – a classic example being Oreo’s hastily pulled together ‘dunk in the dark’ Superbowl ad, during the one hour blackout at the game in 2013. A great success for Oreo, not so much for all the other companies which paid through the nose for a sliver of TV ad space – only to get trumped by an ad on Twitter. Today it deals with 1.6 billion search queries every day and for the past six months, users have been around the 320 million mark. Rather than a boast though, that 320 million figure has been the stick used to beat Twitter with over and over in recent months. Its slowing membership has increasingly stuck out as a warning sign, while Facebook grew into a $100bn behemoth, hoovering up budding platforms like Instagram and Snapchat as it went. Twitter never quite overcame questions about its appeal to a wider audience either – those who embraced it early on often see it as a fundamental social network for them. Those who don’t immediately 'get it' can be in for an isolating and difficult experience to find the right people to follow and get up to speed with the fast-paced real-time newsfeed. There’s also been a long-time trouble with harassment – the platform's ethos is entirely based on free speech, but unsurprisingly many users have been unimpressed with what they’ve seen as Twitter’s slow response – or lack of entirely. So, are we in for some stroppy teen years for Twitter? Since Jack Dorsey returned as CEO, there have been a wave of changes – execs leaving, jobs slashed and a hasty reassessment of features. The introduction of Moments to the platform is still viewed as a cumbersome, unnecessary addition by users. Rumours of increasing the infamous 140-character limit have reportedly been banked, while the change to the timeline to be algorithm-determined rather than entirely real-time has had a lukewarm response. Twitter’s also working on how it can leverage live-streaming service Periscope and short-form video sharing platform Vine more effectively. Dara Nasr, Twitter’s UK head, has summed up Twitter’s task quite succinctly. ‘What we want to do is show the respect and love we have for our existing 320 million users and also open the door for other users.’ The plethora of updated or new features show it’s clearly trying. The backlash from current users and stagnant user numbers suggest it’s not yet working. The very thing its users love about it - the stripped-down and concise format, has also been what's made it so tricky to make money out of. Ads just don't work as well on Twitter as they do on say Facebook, so it has always struggled to deliver commerically. Twitter's plummeting share price has at least stabilised somewhat over the past few weeks, but Dorsey’s made no secret of the fact some big changes are in the works. They'll inevitably ruffle more feathers, but every self-promoting celebrity and story-hungry journalist will be hoping they pay off.